Southeast Asian leaders wrapped up a summit on Saturday with no indication of an agreement on how to address Beijing’s assertiveness in the South China Sea, a divisive issue in a region uncertain about its ties with the United States. 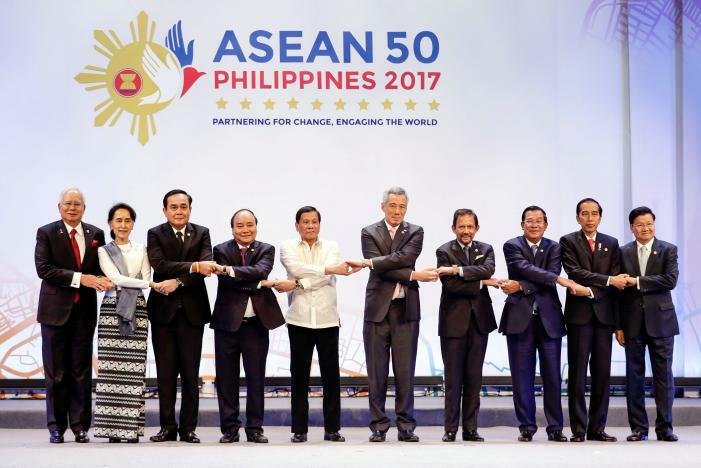 Six hours after the Association of South East Asian Nations (ASEAN) summit officially ended in Manila, no customary joint statement had been issued and it was unclear whether there was agreement over including references to China’s militarization and island-building in the hotly disputed waterway. This year’s summit comes at a time of uncertainty about U.S. interests in the region and whether it will maintain its maritime presence to counter Chinese assertiveness that has often put the region on edge. A spokesman for the Philippines foreign ministry said a statement would be issued on Saturday. Two ASEAN diplomatic sources earlier on Saturday told Reuters that Chinese embassy representatives in Manila had sought to influence the content of the communique. The sources said the Chinese officials had lobbied the Philippines to keep tacit references to Beijing’s island-building and arming of artificial islands out of the statement. But an unpublished draft dated Friday and seen by Reuters included the term “land reclamation and militarization”, which were not featured in a draft two days earlier. The diplomats said four ASEAN member states had objected to it being omitted. China is not a member of ASEAN and was not attending the summit. China’s embassy in Manila could not be reached and its foreign ministry did not respond to request for comment. The content of Friday’s draft would indicate ASEAN was resisting moves by China to keep its contentious activities in the strategic South China Sea off ASEAN’s official agenda. Philippine President Rodrigo Duterte, who chaired Saturday’s meeting, did not answer a question after the summit about whether the statement would refer to “militarization”. He said ASEAN wanted to complete a framework for a maritime code of conduct with Beijing this year to defuse tensions. “They want the code of conduct enacted by the at least, at the very least before the end of this year so that everybody would just feel comfortable,” Duterte told a news conference. Duterte also made a no-nonsense call for calm on the Korean Peninsula and urged the United States not to be provoked by North Korean leader Kim Jong Un, who he said “wants to end the world” and “relishes letting go of missiles”. Duterte spoke by phone to U.S. President Donald Trump late on Saturday, his aide said. The Philippine leader earlier told reporters he would urge Trump not to be provoked by Kim. He called for joint efforts to halt extremism and piracy, and several times stressed the importance of non-interference in a country’s affairs. Duterte also called for collaboration to tackle illegal drugs, amid a fierce crackdown at home that has killed thousands of Filipinos and caused international alarm. “The illegal drug trade apparatus is massive. But it is not impregnable,” he said in opening the summit. 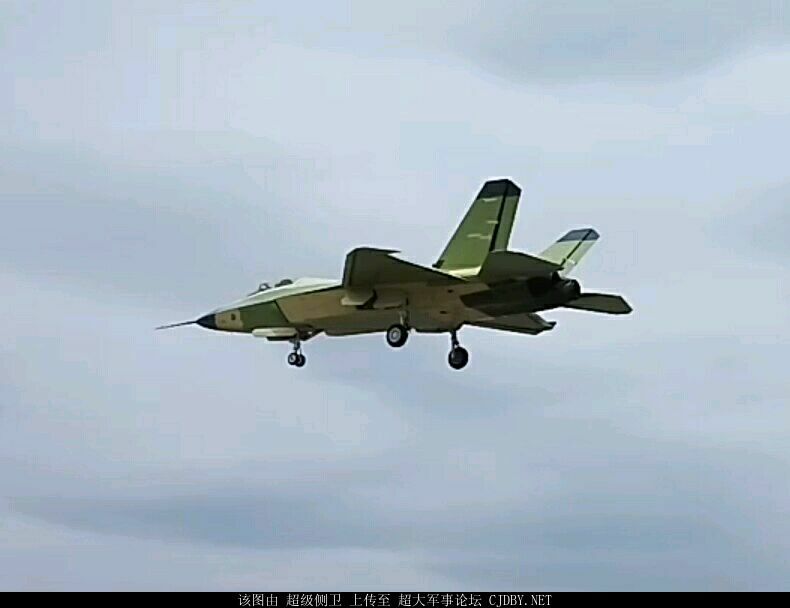 According to LLM75 of cjdby.net, a few days ago, China conducted another test flight of its second improved prototype of FC-31 (J-31) stealth fighter jet it has been developing. 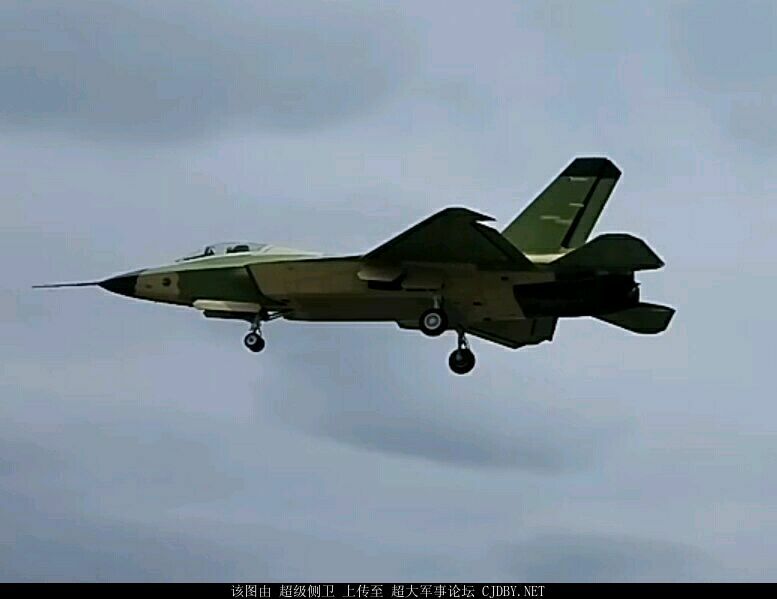 The website has provided the above two photos of the test flight. However, so far there has been no news about its future for export or deployment at home. 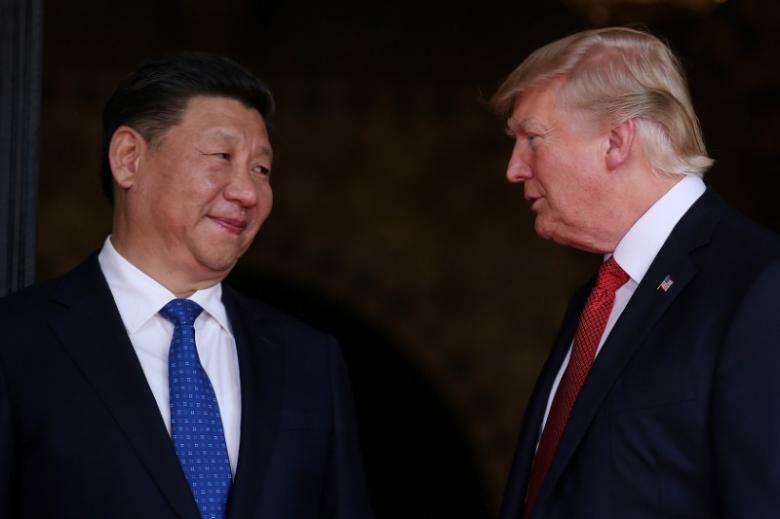 U.S. President Donald Trump’s warm words for Chinese counterpart Xi Jinping as a “good man” will reassure Beijing that he finally understands the importance of good ties, but risks leaving America’s regional allies puzzling over where they fit into the new order. Note: This is Reuters’ article I post here for readers’ information. It does not mean that I agree or disagree with the article’s views. A great leader must be unpredictable in dealing with tricky issues in order to have surprise when he attacks his targets. As a result, the targets are not prepared when he attacks. If they know what his next step will be, they will be well prepared to resist the attack. Xi Jinping does not look shrewd or fearful. In the five years when he was a Politburo Standing Committee member and Vice President, he only did what he was told to do without any exceptional performance. He had thus given the impression that he was but a good boy that will faithfully follow his predecessors’ steps without any creation or innovation. True, Xi talked about his priority to deal with corruption as soon as he was elected, but his predecessor Hu Jintao has talked much and sent inspection teams to various provinces and organizations to fight corruption with little achievement. Xi’s words were but CCP jargon to please the people. The vast number of corrupt officials simply disregarded Xi’s talks. However, on December 4, 2012, less than three weeks after he was elected, Xi Jinping took lightening actions to close the “black jails” set up by local governments in Beijing to imprison petitioners who came to Beijing to seek remedy for local injustices. Xi freed all the prisoners of the black jails. That shocked powerful local officials as six months before Xi’s surprise actions Hu Jintao, the ten top leader, held a national conference on dealing with petitioning attended by high officials including some Politburo Standing Committee members and gave the instruction that local governments should shut their representative offices in Beijing as Hu was clearly aware of local officials’ malpractices in rounding up and persecuting petitioners. However, local officials simply ignored Hu’s instruction and maintained their offices and black jails till Xi suddenly closed them six months later. CCP has a system to accept people’s letters of complaints and petitions at State Bureau for Letters and Calls in order to remedy local injustices. 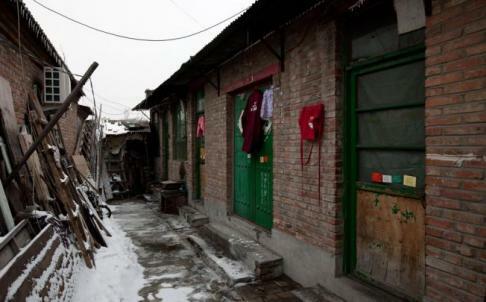 To prevent local malpractices especially corruption from being known by central authority, local governments have set up their representative offices in Beijing to intercept the petitioners. The petitioners rounded up by local governments were locked in illegal detention centers referred to as “black Jails” by media and web users. The thugs employed by local governments used threat and violence to make petitioners promise that they would stop petitioning and then sent them back home. Petitioners were often tortured if they were disobedient. If they persisted in petitioning, they would be sent to local labor camps to receive reeducation through labor for one to four years. According to the reeducation through labor system at that time, police had the power to imprison people in reeducation camps for as long as four years without undergoing any legal procedures. Xi abolished the system later. Xi’s action opened the channels previously blocked by local officials for informing against local corruption through China’s petition system. Previously people did not dare to expose officials’ crimes of corruption as when someone informed about a corrupt official, in order to shield the official, the authority first examines the background of the informer instead of the official exposed. The informer would be punished if anything irregular had been found in the investigation. Even if nothing irregular had been found in the thorough investigation, the informer would have gone through lots of trouble during the investigation. If the official exposed was powerful, he might order his subordinates to frame up the informer and persecute him. However, Xi’s abrupt move made people believe that Xi really wanted to fight corruption. As a result, people began to report officials’ crimes of corruption on the Internet and media. Under Xi’s rule, the exposed official was immediately investigated. If the official was found guilty, he would be punished severely while there was no investigation of the informer at all. Xi’s severe punishment of the corrupt officials exposed by informers greatly encouraged people and scared corrupt officials. 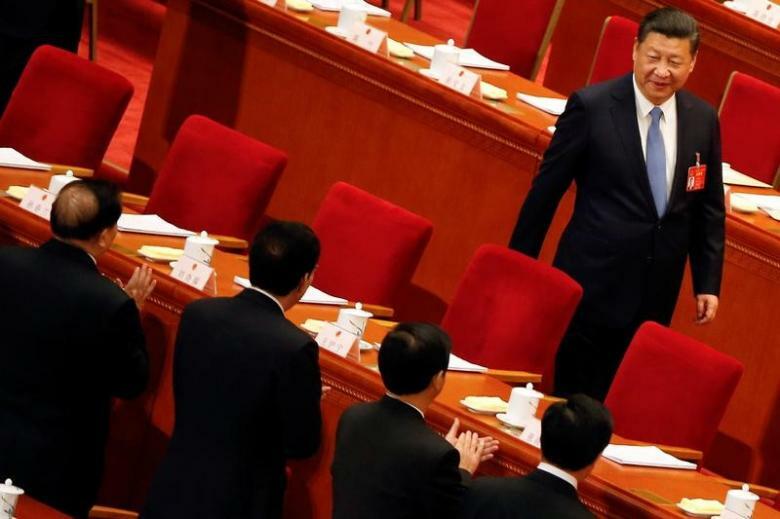 There was expectation that Xi would soon begin a nationwide anti-corruption campaign, but for months Xi remained inactive till people almost lost confidence and officials were no longer scared. Then he gave people a huge surprise. Instead of the much expected anti-corruption campaign, in July 2013, Xi Jinping launched a nationwide seemingly Maoist campaign, the year-long national mass line campaign. He used Mao’s wording on mass line but his mass line is in fact entirely different from Mao’s. It precisely proves how clever he is in manipulating the application of Mao Zedong Thought. In fact, there are three different mass lines: CCP’s traditional, Mao’s and Xi Jinping’s mass lines, the purgatory for officials. CCP’s mass line jargon is “working entirely for and relying entirely on the masses of people; from the masses and to the masses”. It means that CCP works entirely for the masses of people; therefore, it shall learn and understand the opinions and aspirations of the masses of people so as to formulate popular policies. CCP relies entirely on the masses of people; therefore, it shall make the masses of people understand its policies and mobilize them to carry out the policies. There is democratic ingredient in this mass line. This was the mass line implemented by CCP, with which CCP was able to mobilize the masses of people to help it win the Civil and Korean Wars with an army much inferior to its enemies in funding and equipment. The victories of the two wars caused Mao to have an inflated ego. He believed that he was always correct and did not need to know or understand the opinions and aspirations of the masses of people. On the contrary, it was the masses of people who had to study and obey his instructions and do whatever he told them to do because he was always correct. The victories caused Mao to believe that he could succeed in anything as long as he had mobilized the masses of people. As a result, Mao’s mass line was no longer the CCP’s mass line of “from the masses of people and to the masses of people” but a mass line of mass campaigns, i.e. the full mobilization of the masses of people to act 100% in accordance with Mao’s instructions. Mao’s mass campaign for fast economic growth – the Great Leap Forward ended up in his disastrous grand famine. It was followed by his great mass political campaign the Cultural Revolution that put the Chinese nation in chaos. Xi Jinping calls his campaign mass line education practice activities. It differs from both CCP’s and Mao’s mass lines in its goal to make people rectify officials’ work style and impose strict discipline on them through the mass-line purgatory. His mass-line supervision of officials aims not only at overcoming for the time being corruption, being divorced from the masses of people and the four malpractices of formalism, bureaucratism, hedonism and extravagance but also ensuring that officials really become public servants and work for people’s welfare. For officials, the campaign was in fact a typhoon of purgatory. Xi conducted his nationwide mass line education practice campaign for one year to overcome the malpractices of being divorced from the masses of people, formalism, bureaucratism, hedonism and extravagance. Those were the mistakes that almost official from top to bottom had to a certain extent committed; therefore, Xi Jinping calls his campaign an education campaign, i.e. a campaign to educate the officials in order to overcome those mistakes and implement his mass line. In that campaign, all officials had to examine themselves before the masses of people. As they had acted as lords and masters for a long time, they found it very hard to conduct self-examination and self-criticism before humble mass of people, lose dignity and face and promise that they would reform and become the mass of people’s servants. Did that work? Could officials really be made to examine and criticize themselves? Would the masses of people come out to expose officials’ mistakes openly in spite of being used to be scared by officials? The higher officials’ ranks, the more serious their mistakes. Who dare to expose high officials’ mistakes? Take care that there may be retaliation! I will elaborate in my next article Xi’s way to make officials go through the purgatory he set for them. Commercial satellite imagery taken on 11 April shows that significant progress has been made in the construction of the first four Type 055 destroyers for China’s People’s Liberation Army Navy (PLAN). 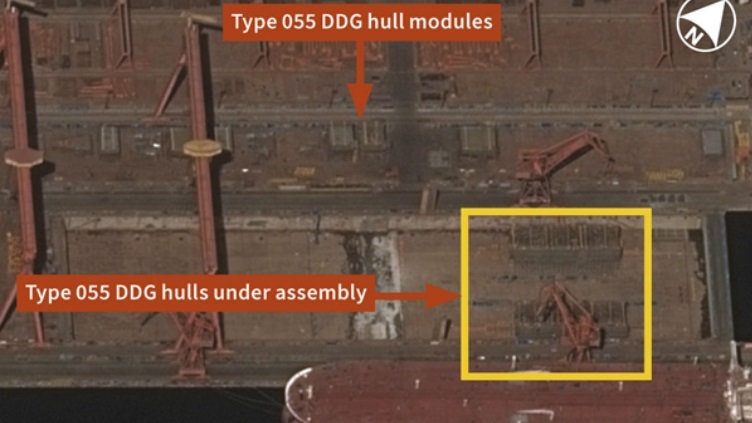 At the Jiangnan Changxingdao shipyard near Shanghai, where construction of the lead ship of the class commenced in late 2014, Hull 1 appears to have all the modules in place and most of the modules for Hull 2 are in position. In late 2016, hull modules appeared on the side of a graving dock at the Dalian Shipbuilding Industry Company (DSIC) yard and by 7 March keel blocks were being positioned in the dock to support the construction of two hulls side by side. By 11 April, modules for two Type 055 hulls had been lifted from the dockside onto the keel blocks and assembly was clearly underway. Measurements from the images indicate that the Type 055 will be about 180 m long and 19 m wide, meaning that it will be significantly larger than the 7,500-tonne Luyang III-class (Type 052D) destroyers (157 m long and 17 m wide). This places the size of the Type 055 between the Republic of Korea Navy’s Sejong Daewang (KDX-3) class (166 m/10,500 tonnes) and the Russian Federation Navy’s Slava class (186 m/11,700 tonnes). The images from Changxingdao show the module that will contain the forward vertical launch system (VLS) cells, with a second grid of cells set to be positioned forward of the hangar. The forward grid appears to be divided into 16 sections, four across and four deep, with overall dimensions of 13 m in length and 10.5 m in width. Comparison with the dimensions of the two 32-cell VLS grids fitted to the Type 052D suggests that the VLS in the Type 055 will have 64 cells in the forward grid. Note: This is IHS Jane’s 360’s report I post here for readers’ information. It does not mean that I agree or disagree with the report’ views. China’s top anti-graft watchdog on Thursday released new information on 22 fugitives who are hiding out abroad down to the street names where they may live, as China ramps up pressure on corruption suspects who have fled overseas. Chinese President Xi Jinping has overseen a multi-year war on graft, promising to quash deep-seated corruption at all levels of the party until officials cannot, dare not and don’t want to be corrupt. The Central Commission for Discipline Inspection (CCDI) took the fight overseas in 2015 by releasing a list of 100 most wanted fugitives which the organization has since sought to return through operations called “fox hunt” and “sky net”. Beijing has struggled to enlist Western countries in its efforts to return corruption suspects, with many proving reluctant to sign an extradition treaty with China, pointing to its poor rights record and opaque criminal prosecution process. CCDI released on its website further images, suspected crimes, addresses and locations for 22 fugitives in the United Kingdom, the United States, Canada, New Zealand, Australia and Saint Kitts and Nevis. The information marks the most detailed personal data released on overseas suspects to date, CCDI official Gao Bo said, according to the official Xinhua news agency. A statement by the CCDI also released on its website said that the current information came from tip-offs from members of the public and encouraged Chinese abroad and foreigners to inform on the fugitives through an online platform so that they had “no place to hide”. “We urge specific countries not to pursue their own economic interests by issuing passports and visas through investment immigration schemes when applicants are suspected of corruption,” the statement said. 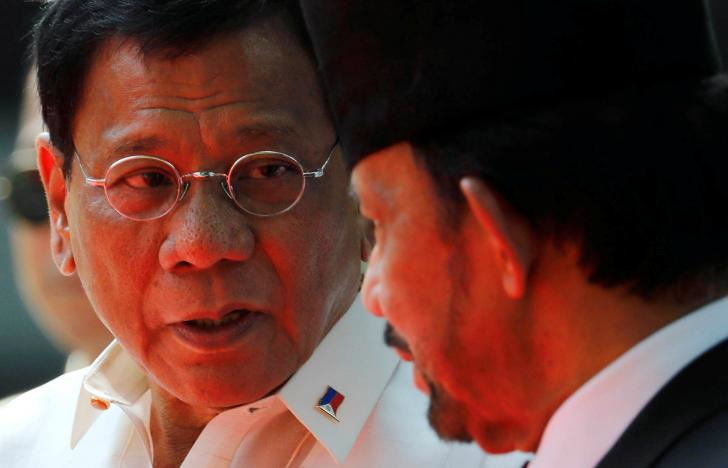 Philippine President Rodrigo Duterte said on Thursday it was pointless discussing Beijing’s contentious activities in the South China Sea at this week’s Southeast Asian summit, and no one dared to pressure China anyway. The no-nonsense former mayor scoffed at questions from reporters about whether China’s rapid reclamation of uninhabited reefs or enforcement of an international arbitration ruling last year would be brought up with leaders of the Association of Southeast Asian Nations (ASEAN) on Saturday. Asked how ASEAN should deal with China, Duterte said dialogue was the only option. “The way we’re doing, talking – that’s the only luxury we have,” he said. The Philippines is hosting meetings of ASEAN this year. The bloc will adopt a softer than usual tone about South China Sea disputes and exclude references to militarization or island-building, according to a draft of the chairman’s statement. The Philippines’ chairing of ASEAN comes amid a charm offensive by Duterte, who has opted to court China for its business and investment and avoid rows over sovereignty that dogged his predecessors. Duterte has been accused by critics of taking a defeatist position on China and on defending Philippine sovereignty. He considers his approach is pragmatic and says challenging China risks triggering a war. The previous government in 2013 filed a case with the Permanent Court of Arbitration in The Hague to set the record straight on maritime boundaries. The tribunal did that last year, and invalidated China’s claim to sovereignty over most of the South China Sea. Duterte, who has put the ruling on the back burner and said he will revisit it later in his term, said it was a waste of time for ASEAN to discuss that award now, and it was not relevant. “Arbitral is simply entitlement. It’s not even a territorial thing. The only question at arbitral was entitlement, not jurisdiction, not even territory,” he said. The Philippines is determined to agree a framework for a China-ASEAN code of conduct on the South China Sea during its chairmanship, though there is some scepticism about why it has China’s support now, 15 years after the idea of drafting a code was agreed. Critics and some diplomats see China’s compliance as a stalling tactic to show it was engaging in diplomacy, while buying time to expand and fortify its presence in the Spratly archipelago. Asked about China’s sincerity towards completing the code, Duterte said tensions at sea were the fault of the United States. The mercurial leader said the issue of piracy would be raised during the summit, but his position was clear. He was also asked his view on the rising tensions over North Korea’s nuclear programme, an issue likely to be discussed by ASEAN.